London Dry style gin and Plymouth style gin are very similar, so I’m going to talk about them like they’re interchangeable. This is the style of gin that your grandfather drinks. It’s dry, light, and clean on the palette and makes for a great crisp foil for many cocktails. This is what most people think of when they think of gin, and if you’re only going to buy one bottle of gin, make it this. Some familiar brands are Tanqueray or Beefeater, but I really like Tyler’s Original City of London Dry Gin (though I couldn’t find it recently, hence the Tanqueray in the photos). International Style gins are usually more creative in their use of herbals, and can go anywhere from floral to briney in their flavor profile. Personally, I love these types of gins because they offer a more robust and interesting palette, but they don’t always blend as well in cocktails. Hendricks is probably the best known of this style, but I’m partial to St. George, both their Terroir and Botanivore gins. The Terroir is a bit more earthy and piney, reminiscent of a coastal hike on a rainy day. The Botanivore is complex, but well-balanced and bright. Of the two it’s probably more suited for cocktail-making. So! Go out and buy yourself some gin. You can either start with just the London Dry, if you’re shy, or you can buy one of each style and really go nuts. I’ll make suggestions of which gins go best in which cocktails, but really, the fun part is that different gins create different cocktails, even if you’re using the same recipe. …Gin and tonic! 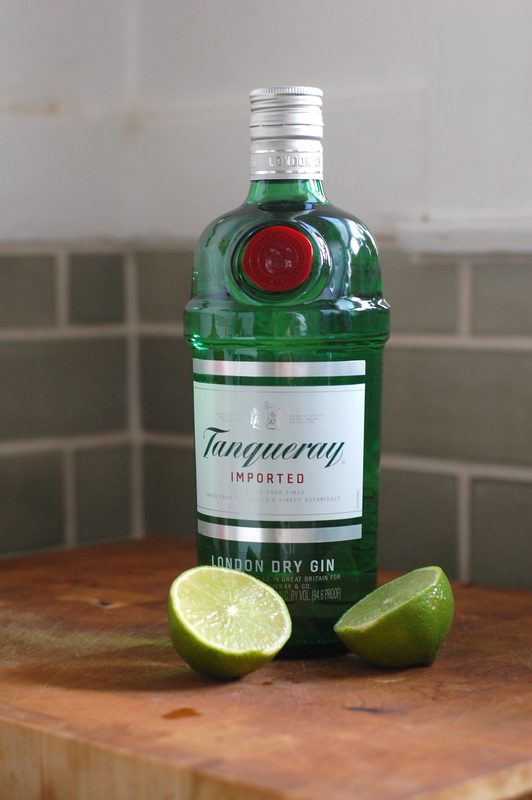 As you may have guessed, the only ingredients you need for this are gin + tonic water. 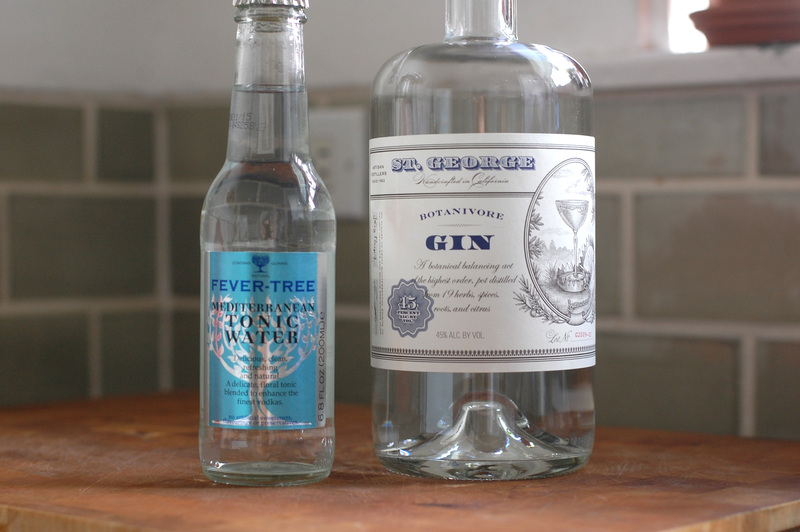 Do yourself a favor and go out and buy some really good tonic; I like Fever-Tree, which you can get at a fancy liqueur store or Whole Foods, but there are a bunch of new fancy tonic waters out there to try. Yes, it is expensive, but it’s fantastic to keep on hand if you really want to impress a date who’s come over for a “drink.” Ahem. Anyway… in my opinion, the best balanced G&T is made by pouring 1 oz gin (whichever one you bought, though London Dry is the classic, and I think the Botanivore goes great in a G&T) over several ice cubes in a glass, then adding 2 oz tonic and giving it a stir. Don’t garnish this with a wedge of lime; go for a big strip of lemon peel instead. …a Gimlet! Yum. A gimlet is just gin + lime juice + simple syrup*. Just shake 2 oz gin (London Dry is the classic, and I think I actually prefer it here) with 0.5 oz each of the lime juice and simple syrup. Strain into a chilled cocktail glass, no need for a garnish. Just a note – when you make a drink with citrus juice in it, it’s really nice to run it though a fine mesh strainer as you’re straining it from the shaker into the glass, like this one. It strains out any chunks and makes for a super smooth cocktail. …a Tom Collins. This is just gin + lemon juice + simple syrup* + soda water. In a tall glass filled 3/4 with ice cubes (a Collins Glass was made for this! 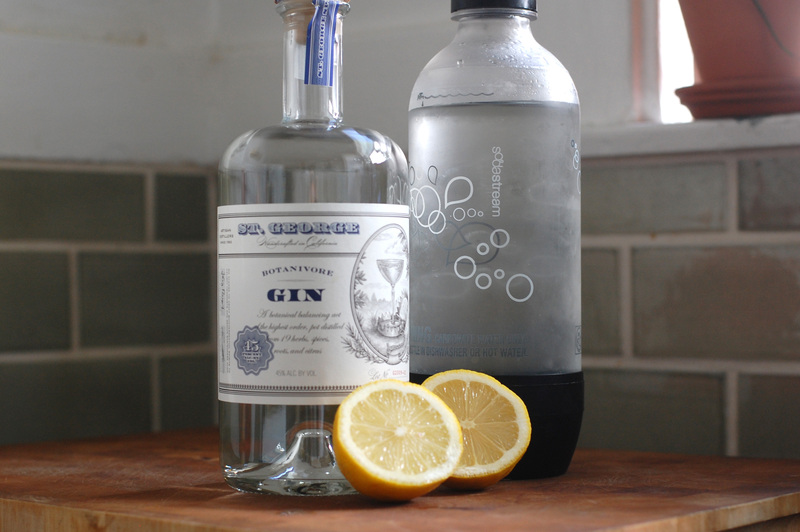 ), pour 2 oz gin (this is where the Terroir really shines) and 0.5 oz each of lemon juice and simple syrup, then stir. Top with soda water and give it another quick stir. This looks nice with a lemon wheel nestled in amongst the ice cubes. Bonus cocktail: If you add an egg white and shake it with the gin, lemon, and simple syrup before straining it into a highball glass (no ice) and topping with soda water, you get a Gin Fizz, the first cousin to the Tom Collins. The trick here is to do a “dry shake” first – meaning the egg white, gin, lemon juice and simple syrup get shaken first, vigorously, without any ice, for about 10 seconds before you do a second shake with ice. Again, you want to double strain this drink with a fine mesh strainer as you pour it into the chilled glass. …the Negroni. Bitter and complex, a Negroni is gin + Campari + sweet vermouth. If you were around for my Rye installment of Building Your Bar, you may already have sweet vermouth kicking around your bar. Most people are familiar with Campari as a bright and bracing bitter Italian liqueur that acts as a versatile digestif (Campari & soda, Americano), but this is the way I like it best. Campari is bitter and can have a bit of a bite, so if you want to try something a little smoother and more sophisticated, Gran Classico is a nice alternative. For the vermouth, Dolin is always a solid choice, especially if you already have it in your bar, but if you really dig bitter flavors like I do, Punt e Mes is a really nice alternative for this drink. 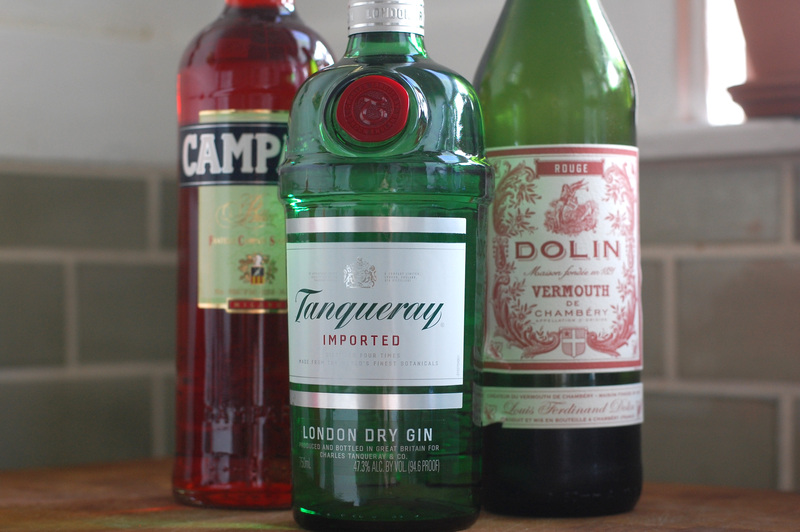 All you need for a Negroni is 1 oz gin (London Dry is best), 1 oz Campari or Gran Classico, and 1 oz vermouth. Stir together in a shaker with ice, then strain into a glass. A Negroni is equally nice on the rocks or straight up. The classic garnish for a Negroni is a big fat wide strip of orange peel (if you’re really feeling festive, char it first a bit with a match). So there you go! To build a versatile bar with gin, all you need is gin (London Dry, plus maybe an International Style), Campari, and sweet vermouth, plus some other incidentals like good tonic water, lemons, limes, egg whites, and simple syrup. With that, you can make a Gin and Tonic, a Gimlet, a Tom Collins, a Gin Fizz, and a Negroni. Such a streamlined setup can yield an impressive array of super summertime cocktails. Enjoy! Yay, gin! Bigger yay, Negroni! I hadn’t tried it with Punt e mes, but that’s next on my list. My contact information is in the “about” section, mysterious stranger. I LOVE gin and I love negronis, so this is kind of my favorite post ever. I love gin and negronis and I have never tried Punt e mes. Now I have an excuse.